HomeeCoursesBible Study Lessons eCourseWhat Does The Bible Say About Home Ekklesia? The first Christian ekklesia at the time of the apostles had no ekklesia buildings, schools, hospitals, or other visible structure. This early ekklesia met in home ekklesia, and sometimes in the open by a river side. (Acts 16:13). Our favorite inspired author put it this way: Yahuwah has an ekklesia. It is not the great cathedral, neither is it the national establishment, neither is it the various denominations; it is the people who love Yahuwah and keep His commandments. Where two or three are gathered together in my name, there am I in the midst of them (Matt. 18:20). Where Yahushua is even among the humble few, this is Yahushua's ekklesia, for the presence of the High and Holy One who inhabiteth eternity can alone constitute an ekklesia. 1. Where did Home ekklesia first get started? In the very first home when Yahuwah met with Adam and Eve in their Eden home. They met together and our first parents enjoyed fellowship and instruction from the Creator. “It was under the trees of Eden that the first dwellers on earth had chosen their sanctuary.” The Desire of Ages, page 290. 2. Did our Master, Yahushua, give His support for the home ekklesia? “And he ordained twelve, that they should be with him, and that he might send them forth to preach, And to have power to heal sicknesses, and to cast out devils: And Simon he surnamed Peter; And James the son of Zebedee, and John the brother of James; and he surnamed them Boanerges, which is, The sons of thunder: And Andrew, and Philip, and Bartholomew, and Matthew, and Thomas, and James the son of Alphaeus, and Thaddaeus, and Simon the Canaanite, And Judas Iscariot, which also betrayed him: and they went into an house.” Mark 3:14-19. 3. Where was the first recorded home ekklesia at the time of the apostolic ekklesia? “And when they were come in, they went up into an upper room, where abode both Peter, and James, and John, and Andrew, Philip, and Thomas, Bartholomew, and Matthew, James the son of Alphaeus, and Simon Zelotes, and Judas the brother of James. These all continued with one accord in prayer and supplication, with the women, and Mary the mother of Yahushua, and with his brethren.” Acts 1:13,14. Answer: Scholars of the Greek concur that this was the same upper room in which the Master celebrated the last supper with the twelve apostles. Notice that while the main body of the Jewish ekklesia was meeting in the temple during this holy period of Pentecost, Yahuwah's little band of true people (the number of names together were about an hundred and twenty, Acts 1:15b) were meeting in an upper room, and not in the corporate ekklesia. And they all continued with one accord in prayer and supplication. (Acts 1:14a). “Verse 13. They went up into an upper room:- Here it evidently means the place where they were assembled for devotion. Lu 24:53 says they were continually in the temple praising and blessing Yahuwah. And some have supposed that the upper room here designated was one of the rooms in the temple. But there is no evidence of that; and it is not very probable. Such a room was a part of every house, especially in Jerusalem; and they probably selected one where they might be together, and yet so retired that they might be safe from the Jews.” Albert Barnes New Testament Commentary. 4. Where else can we find the example of home ekklesia in the New Testament? “And he went into the synagogue, and spake boldly for the space of three months, disputing and persuading the things concerning the kingdom of Yahuwah. But when divers were hardened, and believed not, but spake evil of that way before the multitude, he departed from them, and separated the disciples, disputing daily in the school of one Tyrannus. And this continued by the space of two years; so that all they which dwelt in Asia heard the word of the Master Yahushua, both Jews and Greeks.” Acts 19:8-10. 5. Despite the fact that Cornelius accepted the one true Eloah of the Jew, he did not worship in their synagogue; did Yahuwah approve his practice of home ekklesia? “There was a certain man in Caesarea called Cornelius, a centurion of the band called the Italian band, A devout man, and one that feared Yahuwah with all his house, which gave much alms to the people, and prayed to Yahuwah alway. He saw in a vision evidently about the ninth hour of the day an angel of Yahuwah coming in to him, and saying unto him, Cornelius. And when he looked on him, he was afraid, and said, What is it, master? And he said unto him, Thy prayers and thine alms are come up for a memorial before Yahuwah.” Acts 10:1-4. 6. Are there Other Examples of Home Ekklesia in the New Testament Era? Likewise greet the ekklesia that is in their house, the apostle Paul wrote to the Romans. Salute my well beloved Epaenetus, who is the firstfruits of Achaia unto the Anointed. (Romans 16:5). The ekklesia of Asia salute you, Paul wrote to the Corinthians. Aquila and Priscilla salute you much in the Master, with the ekklesia that is in their house. (1 Corinthians 16:19). Salute the brethren which are in Laodicea, Paul wrote to the ekklesia at Colosse , and Nymphas, and the ekklesia which is in his house. (Colossians 4:15). And to our beloved Apphia, Paul wrote to Philemon, and Archippus our fellow soldier, and to the ekklesia in thy house. (Philemon 1:2). But if I tarry long, that thou mayest know how thou oughtest to behave thyself in the house of Yahuwah, Paul wrote to Timothy, which is the ekklesia of the living Eloah, the pillar and ground of the truth. (1 Timothy 3:15). Notice that the apostle Paul does not identify the Christian ekklesia as a cathedral, or denomination, but he saluted Nymphas, and the ekklesia which is in his house. ( Col.. 4:15b). Then Paul stated that the ekklesia of the living Eloah is the pillar and ground of the truth. (1 Timothy 3:15). 7. For what reasons were the home ekklesia established? A. Because of prejudice and unbelief: “And he went into the synagogue, and spake boldly for the space of three months, disputing and persuading the things concerning the kingdom of Yahuwah. But when divers were hardened, and believed not, but spake evil of that way before the multitude, he departed from them, and separated the disciples, disputing daily in the school of one Tyrannus. And this continued by the space of two years; so that all they which dwelt in Asia heard the word of the Master Yahushua, both Jews and Greeks.” Acts 19:8-10. “[Separated the disciples] Paul, and those converted under his ministry, had doubtless been in the habit of attending public worship in the synagogue: but, on the persecuting conduct of these Jews; he and his converts wholly withdrew from the synagogue, and took a place for themselves; and constantly afterwards held their own meetings at a school room, which they hired no doubt for the purpose.” Adam Clarke's Commentary. B. Because there’s no place of worship: “And on the sabbath we went out of the city by a river side, where prayer was wont to be made; and we sat down, and spake unto the women which resorted thither. And a certain woman named Lydia, a seller of purple, of the city of Thyatira, which worshipped Yahuwah, heard us: whose heart the Master opened, that she attended unto the things which were spoken of Paul. And when she was baptized, and her household, she besought us, saying, If ye have judged me to be faithful to Yahuwah, come into my house, and abide there. And she constrained us.” Acts 16:13-15. “Lydia received the truth gladly. She and her household were converted and baptized, and she entreated the apostles to make her house their home.” The Acts of the Apostles, page 212. C. Because of Apostasy and corruption in the organized "churches": “And after these things I saw another angel come down from heaven, having great power; and the earth was lightened with his glory. And he cried mightily with a strong voice, saying, Babylon the great is fallen, is fallen, and is become the habitation of devils, and the hold of every foul spirit, and a cage of every unclean and hateful bird. For all nations have drunk of the wine of the wrath of her fornication, and the kings of the earth have committed fornication with her, and the merchants of the earth are waxed rich through the abundance of her delicacies. And I heard another voice from heaven, saying, come out of her, My people, that ye be not partakers of her sins, and that ye receive not of her plagues.” Revelation 18:1-4. Behold, every one that useth proverbs shall use this proverb against thee, saying, As is the mother, so is her daughter. Thou art thy mother's [Rome's] daughter, that loatheth her husband [Yahushua] and her children [Yahuwah's professed people who preach the three angels' messages]; and thou art the sister of thy sisters [apostate Protestantism]... Ezekiel 16:44-45. Flee out of the midst of Babylon, and deliver every man his soul: be not cut off in her iniquity... My people, go ye out of the midst of her, and deliver ye every man his soul from the fierce anger of Yahuwah. Jeremiah 51:6, 45. Yahushua requires personal faithfulness of His servants, and we are to show that we have no fellowship with the secret, hidden things of darkness. The wheat is not to sow itself among the tare; for although we may not practice the works of some of the members of the secret orders, in joining them we are registered in heaven as partakers of their evil deeds, responsible for their works of evil, and bound up in bundles with them as tares. Thank Yahuwah, it is not too late for Christians to sever themselves from all unholy connections, and come fully unto the side of Yahushua. D. Because of persecution from the organized "churches": “Then the same day at evening, being the first day of the week, when the doors were shut where the disciples were assembled for fear of the Jews.” John 20:19. “Beloved, when I gave all diligence to write unto you of the common salvation, it was needful for me to write unto you, and exhort you that ye should earnestly contend for the faith which was once delivered unto the saints.” Jude 1:3. 8. How many believers can start a home ekklesia? “For where two or three are gathered together in my name, there am I in the midst of them.” Matthew 18:20. "[Yahuwah] has a [ekklesia]. It is not the great cathedral, neither is it the national establishment, neither is it the various denominations; it is the people who love [Yahuwah] and keep His commandments. Where two or three are gathered together in my name, there am I in the midst of them (Matt. 18:20). Where [Yahushua] is even among the humble few, this is [Yahushua's ekklesia], for the presence of the High and Holy One who inhabiteth eternity can alone constitute [an ekklesia]." Upward Look, page 315. Where two or three are present who love and obey the commandments of Yahuwah, Yahushua there presides, wherever it may be. 9. How do I start a home ekklesia? To start an ekklesia in your home is a privilege and honor beyond human comprehension. It means that Yahushua will bless your home with His presence, during the sacred hours of the holy Sabbath. 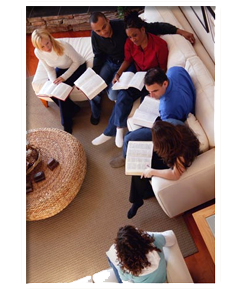 A home ekklesia can be carried out in a similar format as normal ekklesia services. It is most proper that each worship meeting should include prayer in a kneeling position (Psalms 95:6), a testimonial & witnessing time (giving opportunity to recount Yahuwah's goodness and providence during the past week), and Bible study. Also, song service can be included and collection of tithe and offering. A home ekklesia may begin with just you and you may invite members of your family, neighbors, work colleagues, friends to attend. The scope of activities at the home ekklesia will depend on the number of committed members in regular attendance. As the number increases more activities can be undertaken. Throughout the home ekklesia service there should be an atmosphere of silence and holy reverence, remembering that Yahuwah is in His holy temple: let all the earth keep silence before Him. Habakkuk 2:20. All the service should be conducted with solemnity and awe, as if in the visible presence of the Master of assemblies. If there are children present, a Sabbath school should be held for their benefit. Time should be dedicated to teach the children. Yahuwah is shut out when children of ekklesia members run about, play and talk. The house of Yahuwah is desecrated and the Sabbath violated by Sabbath believers' children. They run about the house, play, talk, and manifest their evil tempers in the very meetings where the saints have met together to glorify Yahuwah and to worship Him in the beauty of holiness. The place that should be holy, where a holy stillness should reign, and where there should be perfect order, neatness, and humility, is made to be a perfect Babylon and a place where confusion, disorder, and untidiness reign. This is enough to shut out Yahuwah from our assemblies and cause His wrath to be kindled. The ekklesia service should occupy only a part of the Sabbath. It is necessary that the people of Yahuwah assemble to talk of Him, to interchange thoughts and ideas in regard to the truths contained in His word, and to devote a portion of time to appropriate prayer. But these seasons, even upon the Sabbath, should not be made tedious by their length and lack of interest. It would be a great blessing to hold a worship meeting on the Sabbath, as determined by Yahuwah's calendar, which is not Saturday. See articles on Yahuwah's Calendar. 10. What gifts are given to help unite Yahuwah’s ekklesia? “And he gave some, apostles; and some, prophets; and some, evangelists; and some, pastors and teachers; For the perfecting of the saints, for the work of the ministry, for the edifying of the body of the Anointed: Till we all come in the unity of the faith, and of the knowledge of the Son of Yahuwah, unto a perfect man, unto the measure of the stature of the fulness of the Anointed” Ephesians 4:11-13. Answer: The gifts of prophets, pastors, teachers etc. given to build up the ekklesia as well as equip Christians for work, are to remain in the ekklesia until we all reach unity in the faith. Therefore we expect to see organization in Yahuwah’s true ekklesia today. Throughout his entire ministry, Paul, the great evangelist of the New Testament, was careful to institute proper organization in the ekklesia he established. In fact, Paul thought organization was so important, that a short time after he had been stoned in Lystra, he returned to organize the ekklesia. He saw that gospel order (which included the appointment of elders and deacons) was an important factor in the spiritual growth of the new converts. It was a safeguard against error and fanaticism and promoted unity among the believers. In place after place, Paul diligently instructed and aided ekklesia in the establishment of proper order. Proper ekklesia order will help squelch some of the rampant fanaticism existing today and promote unity among the brethren. There is order in heaven; and there should be system and order upon the earth, that the work may move forward without confusion and fanaticism. 11. What was the first recorded step taken to organize the apostolic ekklesia? “The first step was now to be taken in the organization of the ekklesia that after [Yahushua's] departure was to be His representative on earth.” The Desire of Ages, page 291. 12. Were early Christians organized into an ekklesia after Yahushua’s ascension? “Praising Yahuwah, and having favour with all the people. And the Master added to the ekklesia daily such as should be saved.” Acts 2:47. Answer: Yes, in Lycaonia and Pisidia, “[ekklesia] were duly organized in all places…where there were believers. Officers were appointed in each ekklesia, and proper order and system were established...” The Acts of the Apostles, page 185. The ekklesia in Thessalonica was also “properly organized.” “Officers had been appointed to act as ministers and deacons.” Ibid., page 261. Regarding the work in Crete, Paul instructed Titus to “set in order the things that are wanting, and ordain elders in every city, as I had appointed thee.” Titus 1:5. 13. How the leaders of each ekklesia were chosen and what were they called? “And when they had ordained them elders in every ekklesia, and had prayed with fasting, they commended them to Yahuwah, on whom they believed. And when they were come, and had gathered the ekklesia together, they rehearsed all that Yahuwah had done with them, and how he had opened the door of faith unto the Gentiles.” Acts 14:23, 27. Answer: There was organization in the early Christian ekklesia. Leaders were chosen and ordained as elders. Through ordination, ekklesia members recognize a person’s spirituality and ability to serve the ekklesia in a leadership capacity. As we look into His created works, we see that Yahuwah is thoroughly organized and His ekklesia in the days of the Apostles was to work smoothly too. 14. What was the instruction given to the early ekklesia by the apostles in the selection of deacons? Answer: This advice was followed, and by prayer and the laying on of hands, seven chosen men were solemnly set apart for their duties as deacons. We see that the apostles did not themselves alone choose the deacons, but the entire [ekklesia] recognized those, from among its membership, who were “of honest report and full of the Holy Ghost.” We are not told exactly how the process of the selection worked. Today, in some small ekklesia, all the members are directly involved in the selection of officers. In other ekklesia, members select a group of members, called a nominating committee. This committee selects, considers and prays about various potential candidates. When they are finished they recommend to the [ekklesia] at large their completed list of candidates. The [ekklesia] then votes to accept or reject the recommendations of the committee. For new, small ekklesia, we are given this extremely practical counsel in regards to choosing a leader for [an ekklesia]. “Such arrangements should be made for the little companies accepting the truth as shall secure the prosperity of the [ekklesia]. One man may be appointed to lead for a week or a month, then another for a few weeks; and thus different persons may be enlisted in the work, and after a suitable trial someone should be selected by the voice of the [ekklesia] to be the acknowledged leader, never, however, to be chosen for more than one year. Then another may be selected, or the same one may be re-elected, if his service has proved a blessing to the [ekklesia].…Many fail to exercise proper discernment in these important matters where eternal interests are involved.” Testimones for the Church, Volume 5, page 619. Consideration of whether a person meets the qualifications for an office is necessary. What are some of the questions that should be asked about a person being considered for a leadership position in the ekklesia? “The family of the one suggested for office should be considered. Are they in subjection? Can the man rule his own house with honor? What character have his children? Will they do honor to the father’s influence? If he has not tact, wisdom, or power of [Yahuwah-likeness] at home in managing his own family, it is safe to conclude that the same defects will be carried into the [ekklesia], and the same unsanctified management will be seen there. It will be far better to criticize the man before he is put into office than afterward, better to pray and counsel before taking the decisive step than to labor to correct the consequences of a wrong move.” Testimones for the Church, Volume 5, page 618. 15. Is it right that there should be a head elder or deacon? In Story of Redemption we find that Stephen was chosen to stand at the head of the seven deacons. He was to lead them. He was thought the best qualified because of his multi-cultural ability in the midst of the tension between the Jews and Greeks. Enables ekklesia to successfully give the Three Angels’ Messages and the loud cry of Revelation 18. Is an important factor in the spiritual growth of ekklesia members. Serves to unite in one body all believers in Yahushua (Acts of the Apostles, page 89). Enables ministers and elders to be able to work more effectively. Increases the number of believers (Acts 6). Increases the strength of believers (Act 6:7). 16. What about tithe and offerings in the home ekklesia, does Yahuwah want it to be practiced? Yes, as we have realized in this study that home ekklesia are ordained of Yahuwah, it is expected of them as well to faithfully perform their stewardship to Yahuwah. In fact the apostles left us examples and instructions to be followed. 17. Who was tithe to be given to in the time of the Apostles?